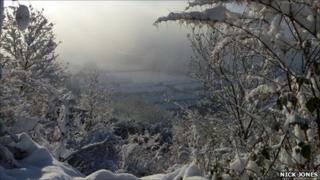 More snow has fallen across Wales and sub zero temperatures are expected overnight. West and north Wales have been particularly affected by snow on Tuesday with reports of up to 3ins (7.6cm) deep in Bala and heavy snowfall in north Anglesey. North, east and south west Wales are in line for more snow overnight and the Met Office has warned of ice. Meanwhile, councils warned of low grit supplies. John Davies, head of the Welsh Local Government Association (WLGA), said Welsh ministers should ask the UK Government to release some of the 150,000 tonnes of grit English council have in reserve. He said Wales has 12,000 tonnes in reserve and just four or five days of grit left before more supplies were due to arrive. An assembly spokesperson said: "We remain in close contact with the WLGA and the UK Government's Department of Transport to review the distribution of salt, monitor salt grit levels and ensure that Wales receives adequate supplies of salt." Earlier on Tuesday, motorists faced delays on the A55 in Penmaenmawr, Conwy, while icicles were cleared from tunnels in the area. Peter Roberts, of North Wales Traffic Control, said falling icicles were a real danger. "A lot of places don't have tunnels like we have so we've had to close tunnels to get the icicles out because they are obviously a danger to the public. "If one of those went through a windscreen, you'd have real problems." Meanwhile, the cold snap continued to affect the transport network in many parts. Heavy snow in Pembrokeshire affected bus services and roads were reported as gridlocked. Snow flurries also took hold in St Clears, Carmarthenshire. On the roads, Traffic Wales said hazardous conditions were reported on various main routes. The bad weather is affecting traffic travelling between Tenby and Pembroke with the A4139 closed in both directions due to snow between A4218 Heywood Lane (Tenby) and Cob Lane (Jameston). In the north the A470 Crimea Pass remains closed in both directions due to snow between Glanypwll Road (Blaenau Ffestiniog) and A5 (Betws-Y-Coed). Cardiff airport is open but passengers are advised to check the airport website for the latest flight updates and to contact their airline or tour operator with specific inquiries. Forecasters said there appears to be no sign of a thaw with cold temperatures remaining right up to the Christmas weekend. "There is further snow in the forecast," said BBC Wales weather presenter Sue Charles. "The cloud was thick enough to produce a few snow showers earlier on Tuesday, particularly across north and east Wales, and south west, and those areas are in the firing line Tuesday night. "And again, there are sub zero temperatures right across Wales." Wales' Transport Minister Ieuan Wyn Jones said the government is trying to cope "as best as we can in difficult circumstances". Although some rail services were delayed or cancelled on Tuesday the situation regarding buses was improving. Meanwhile, a group of 36 school children were among countless people whose Christmas plans have been disrupted by the travel chaos caused by the snow. The students at King Henry VIII school in Abergavenny, had been on a skiing trip in the US and were due to leave Boston for Heathrow on Monday but are currently holed up in a hotel. Richard Brown, whose 14-year-old daughter Emily is on the trip, said they were hoping the youngsters could fly to Florida and then on to Gatwick, arriving in the UK on Christmas Day. "The teachers are trying desperately to get something done," he said. "They [the pupils] are fed up. They are running out of money."